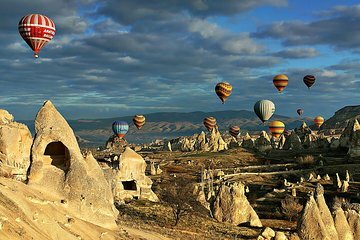 Sample the magic of Cappadocia on this 2-day tour from Side, including overnight accommodation and dinner. Your varied itinerary includes a visit to the Saratli underground city, Uchisar Castle and Cavusin village, as well as plenty of photo stops to capture the fairy chimneys of Devrent Pasabag and Lovers valleys, and the iconic Three Beauties in Urgup. For the ultimate view, opt for an upgrade and enjoy a sunrise hot air balloon ride over Cappadocia’s dream-like landscapes. I was very surprised when a coach that fit 40 people on turned up as transport for the trip. The tour guide more or less just shunned us on the coach after taking my voucher. After we had picked the last few passengers up it then became evident that there were very few English people on the trip, in fact there were 4 of us in total. The tour guide spoke fluent Russian and very little English. He explained everything in Russian and then attempted to in English giving us basic and simple information as he didn't have the ability to explain in as much information as he did for the Russians. I will like to point out here that I did in fact book an English tour!! The coach we were on was full with one empty seat and soon got very warm and stuffy. The driver very rarely put the air conditioning on over the two days so it was a very uncomfortable journey may I add a 6 hour journey. When we got to the hotel we were advised dinner was at 7pm which was of very poor quality and we weren't even provided any free bottle water to have which was surprising. Breakfast was of even worse quality, I am just glad we thought ahead and brought our own snacks which were a life saver! There was quite a few things that cost additional money, the underground city cost 10 lira per person, a small buffet lunch at a chosen restaurant in pigeon valley cost 30 lira per person, goreme air museum also cost 30 lira per person on top of the fee already paid for the trip. As well there are options to go to a Turkish night in the evening which had an additional cost as well as the option to go in the hot air balloon which was around 140pp. The sights we went and saw were phomenomal and breath taking and are very worth it, but our tour was ruined by the hot uncomfortable journey on the coach and the lack of English information being provided. The tour guide explained everything in Russian first and then in English and there were times when we were forgotten and had no clue what was going on. The tour was amazing even if we didnt get that much time at each place as it was only a two day tour. Tour guide Ida was amazing and made the whole trip with her fun personality and even organised a birthday cake for me at the Turkish night. There was so much to see and the hotel we stayed in was very nice and Turkish night alot of fun, drink and dancing. it is a long way to travel from Side but the bus was air conditioned and very comfortable. The only thing i would say is some of the places we visited did try and sell to you which if you want to purchase something is great if not can feel a bit uncomfortable, but dont let this put you off as Cappadccia is a must place to visit . Wow! A great tour with lots to see. Our guide Nejo was great and shared a lot of information about each of the areas that we visited. There are quite a few optional extras offered on this one and my advice is to take all of them if it's in your budget. The lunches were great, the Turkish Dance Night was wonderful with all our drinks and some nibbles included and the Hot Air Balloon flight was absolutely amazing. You actually get to see all of the sights over again but from the air. Over 30 balloons were in the air at the same time so plenty of opportunity for great photos. The hotel, while not quite 4-star was comfortable and clean and the meals were also good. I can recommend this tour if you want to see a very special part of Turkey. I had an amazing time on this tour. Nejo our guide was full of information and patience, he stayed with those who wanted to go to the late night show and got up at 3am the next morning for those wanting to do the hot air balloon ride and still continued to be kind! Do the hot air balloon ride, it is extremely worth it around 140 euros. I was also impressed with the included hotel, the rooms were lovely and the food all included in this cheap tour price. Being a solo traveller I got a room for myself no extra cost. The first day is a very long day and you see a lot after 5 hours of travelling so prepare yourself. Very happy!